One predictive stats analyst -- who is pretty good at his job -- believes Utah point guard Delon Wright will be college basketball's best player this season. Think about that last college basketball season. How unpredictable was all that? Who could have foreseen Kentucky see-sawing like it did, from hyped as having the best recruiting class ever, to struggling through a roller-coaster regular season to dashing to the national title game as an 8-seed? Who could have predicted Wichita State’s undefeated run from November until March? And did anyone out there see Shabazz Napier and UConn coming? Anyone even want to hazard a guess for what’ll happen this year? John Pudner would like to. He’d also like you to think he has as good of a shot as anyone at getting it right. Pudner, a 49-year-old father of nine, is a political campaign professional and a statistical savant who likes to say he “lives in spreadsheets.” In recent years he’s turned his Excel expertise toward college basketball. Know this about the Alabamian who once ran state-level presidential campaigns for George W. Bush and Mitt Romney: Few things give him more satisfaction than picking the correct underdog before anyone else. And it doesn’t matter whether it’s in basketball or in politics. This isn’t to suggest that Pudner’s March Madness bracket is filled with 14- and 15-seeds making the Sweet 16 just so he can get the satisfaction of having picked that one Cinderella. As a spreadsheet guy, Pudner’s projections are based in cold, hard numbers, not gut instinct. We’ll get to his basketball underdogs in a minute. But first, let’s look at Pudner’s biggest political underdog pick. That came this summer, when he identified early on that the Virginia Congressional seat of House Majority Leader Eric Cantor was susceptible to an upset. The numbers told him there was an usually high number of politically active conservatives in Virginia’s 7th Congressional district who were motivated to beat Cantor. With number-crunching and voter-targeting, Pudner thought the right candidate could overcome an inevitable lack of funding. He helped find a Libertarian-leaning Republican, little-known university economist Dave Brat, to run for the seat. And despite Cantor’s high profile and the fact the Cantor campaign spent nearly $5 million to Brat’s $200,000, the underdog won. It was what some political observers called one of the biggest upsets in American political history. So when Pudner tells you an off-the-radar point guard from the University of Utah could be the next national player of the year – well, he might just have something there. So how has Pudner’s predictive statistical formula done in ranking the 351 teams and 4,000-plus players in Division I college basketball? In many cases, shockingly well. His formula identified UConn’s Napier as a potential All-American two years before he was on most people’s radars and well before he led the Huskies to one of the more surprising national titles in history last season. He correctly picked Georgetown’s Otto Porter as the Big East player of the year a season after Porter had averaged fewer than 10 points per game. And he pegged Wisconsin center Frank Kaminsky as a first-team All-American well before his breakout performance in the most recent NCAA tournament. All of this is a long way of saying that when Pudner proclaims to have a bead on which teams could be the top teams in college basketball this season – as well as which players have an inside track to become All-Americans – you should probably pay attention. He gave me an advance look at his projections before posting them on his website. And though I think Kentucky is hands-down the best team in college basketball this season – a team that ought to have as legit of a chance as any team in recent years to go undefeated – I wasn’t shocked when Pudner’s projections had Kentucky as the third-best overall team, behind Kansas and Duke. His value-add numbers calculate how many points per game a player is worth to a team over a replacement player, similar to the Wins Above Replacement statistic that’s in vogue in baseball. But his team projections use only the top five value-add numbers on each squad, so it makes sense that an extraordinarily deep team like Kentucky wouldn’t rank as high in his projections. But when I saw the top 10 names in his player rankings, I was shocked. 1. Delon Wright, G, Utah 13.17 Finished No. 2 to Shabazz Napier last season. A guard who hits 62% of his two-pointers, is in the top 1% in steals on www.kenpom.com and keeps up that pace for 91.7% of his team’s minutes is hard to top. He almost single-handedly pushed Utah to No. 42 in Pomeroy’s ratings last year. 2. Fred VanVleet, G, Wichita State 10.59 Pomeroy ranks him as the 14th-most efficient player last season (130.3 per 100 trips) and in the top 2% insteals. He was in the top 2% in assists for an undefeated team. 10.20 Many were stunned when Value Add calculated Kaminsky as a first-team All-American on Feb. 15, but by the end of March everyone else was a believer. The announcement he would wait on the NBA gives the Badgers title hopes. 4. Montrezl Harrell, F, Louisville 10.17 A Value Add second-team All-American last season, Harrell hit 7 of 9 shots and grabbed 8 rebounds before fouling out against Kentucky in the finale. The loss may have helped him decide to come back for a title. 9.83 Value Add adjusts for level of competition and still has Hunter as one of the top 5. He single-handedly dominates the turnover exchange — in the top 2% of steals and the 19th-best at protecting the ball on offense. He did this while scoring 31 points four or more times last season. He gives Georgia State a good chance to win a tough Sun Belt and be the best low-major team in the country. 9.51 Weber stole the ball on 6.82% of opponents’ trips down the court despite playing in the tough A-10. The next-best figure of any high- or mid-major player was Fuquan Edwin at 5.35%. Weber is easily the top defensive player returning this year – taking 3.32 points per game away from opponents. 9.50 According to Pomeroy, he was by far Florida’s best offensive player last season and the fifth-best shooter of any major conference player (63.3 eFG% for 2nd straight year). 8. Perry Ellis, F, Kansas 9.14 By far Kansas’ best offensive player according to Pomeroy. One of the most balanced players in the game — ranked in shooting, offensive rebounding, defensive rebounding, turnover rate and drawing fouls. 9.12 Despite his team’s slide at the end, Paige closed with 24 points against Duke, 27 against Pitt, 19 in an NCAA win over Providence and 19 in UNC’s finale against Iowa State. With all of North Carolina’s talent, his ability to distribute will determine if it is back near the top. 10. Jalan West, G, Northwestern State 9.08 One of the few players in the country to assist on more than a third of his teammates’ baskets while on the court, leading Northwestern State to 86.6 points a game (second in the country). Scored 30 in upset of Auburn, 15 with 9 assists and 5 steals against Memphis and 26 with 8 assists and 7 rebounds against Baylor. Instead, his No. 1 player in the nation is Delon Wright, the senior point guard at Utah, a team that played in the NIT a year ago. Other names in his top 10 are just as surprising. Fred VanVleet, the motor of last season’s Wichita State team, ranks second. Kaminsky is third. Likely lottery pick Montrezl Harrell isn’t a huge surprise at fourth. But how many casual college basketball fans know the name R.J. Hunter, the sharp-shooting junior for Georgia State who Pudner has ranked as the fifth-best player in the nation? And how many college basketball devotees have heard the name Jalan West, a 5-foot-10 point guard at Northwestern State who Pudner projects as the 10th-best player in the nation? Yeah – and now, me too. I was surprised just how in line Pudner’s numbers-based analysis was with my reporting. During the July recruiting season, I spoke with many college assistants and head coaches who filled up gyms scouting their next recruiting classes. A question I posed to many of them was this: Which teams could end up as surprising teams in the 2014-15 season? A common answer among West Coast coaches was Wright-led Utah. Another common answer among mid-major coaches was Georgia State – a team Pudner’s rankings peg as 35th in the nation, putting it in the top 10 percent of schools nationally. Pudner’s numbers build on the work of college basketball statistics guru Ken Pomeroy and his tempo-free statistics website, KenPom.com. But they take those numbers to a new level by assigning a specific amount of points a player is worth to his team, combining offense and defense. The formula gives special weighting to steals because a steal takes away an opponent’s chance of scoring points before it even has a chance to take a shot. So a player who forces steals is generally causing additional turnovers that do not show up in his personal stats, Pudner explained. 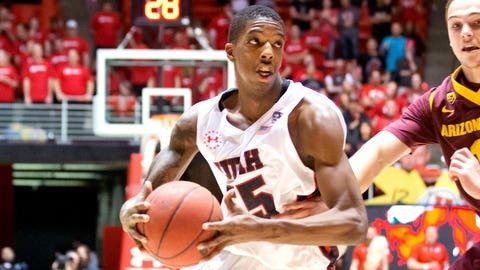 Wright, for example, is worth 13.17 points per game to Utah. If Wright couldn’t play in a game, a replacement player – which Pudner defines as the eighth or ninth player in the rotation of a high-major team – would take his place. Pudner’s formula projects that a 12-point Utah win with Wright would turn into a one-point Utah loss without him. The extra step he’s taken with future projections is estimating how much the average player improves over the course of each of his four seasons in college basketball. By his calculations, sophomores average a 102 percent improvement from their freshman seasons, meaning the average Value-Add number more than double from freshman to sophomore years. From sophomore to junior years, the average improvement is 31 percent. From junior to senior years, 16 percent. Pudner knows numbers aren’t everything. Numbers can look good – too good – for players who feast on inferior competition, so a player’s Value Add is calculated against the defenses the player faced. It could be easy to discount one of the most surprising players in Pudner’s upcoming season’s projections – West of Northwestern State – as a player benefiting from inferior competition. Defenses faced by Northwestern State gave up an average of 106.9 points per 100 trips down the court based on calculations at KenPom.com – well above the national average of 104.3. But West’s surprising placement as a top-10 player stood even adjusting for such weak defenses. And even though Pudner had never seen West play, a glance at his statistics against big-time conference schools indicated he was no outlier. Last season, West racked up 26 points, eight assists and seven rebounds against Baylor, 15 points, nine assists and five steals against Memphis and 30 points, six assists and nine rebounds against Auburn. And his overall numbers had him as one of the top players in the country in both assist rate and steal rate. Pudner knows the odds are against his oddsmaking actually being spot-on. That’s the problem with projecting: It assumes all humans progress at the exact same rate. We know that’s not true. But Pudner believes there’s truth in the numbers that say that Delon Wright – the ultimate underdog, not some five-star recruit from a blueblood – has as good of a chance as anyone at being the nation’s most valuable player. It may sound like a guy who is hedging his bets. But really it’s just a guy who knows the numbers.